Heat stress during the ripening stage reduces the yield and quality of rice. Considering the adverse effects of global warming, it is necessary to breed heat stress tolerant rice cultivars and analyze their stress tolerance characteristics. We investigated the ripening characteristics and antioxidant enzyme activity of Ilmi under heat stress condition during the ripening stage. Ripening rate, 1000 brown grain weight, and rice quality of Ilmi were not significantly changed by heat stress during the ripening stage. Leaf chlorophyll, chlorophyll a/b ratio, and malondialdehyde (MDA) contents of Ilmi leaves were also less changed than those of Ilpum. These results strongly suggested that Ilmi has heat tolerance characteristics during the ripening stage. Analysis of antioxidant enzyme activity of Ilmi revealed that peroxidase (POX) activity was significantly higher than that of Ilpum, and showed a significant correlation with the change in chlorophyll a/b ratio and hydrogen peroxide content of flag leaves of Ilmi. These data suggest that the high POX enzyme activity of Ilmi could be considered one of its major heat tolerance characteristics. Average temperature has been increasing worldwide due to global warming. Due to increased average temperature, extreme high temperature event and climatic variability have occurred more frequently than before (Lloret et al., 2012). Average temperature is predicted to increase 2 ~ 4℃ by the end of the 21st Century and 41% of yields in rice are estimated to be decreased (IPCC 2013). High temperature reduce leaf photosynthesis and enhance leaf senescence rate (Siebert et al., 2014). In addition, if heat stress condition occurs at the flowering time in crops, grain numbers and weight are greatly reduced (Porter et al., 1999; Dolferus et al., 2011; Ugarte et al., 2007). In rice, high temperatures shorten ripening period, cause the reduction of starch accumulation in grain and decrease rice yield (Kim et al., 2011). High temperature can also dramatically affect rice quality by increasing the appearance of chalky grain (Tashiro & Wardlaw, 1991). High temperature can accelerate the proliferation of endosperm cells and affect the occurrence of chalky rice (Morita et al., 2005; Chen et al., 2006; Nakagawa et al., 2006). Reactive oxygen species (ROS) are generated by heat stress and are generally known to affect plant growth, but they also increase the incidence of chalky rice (Kaneko et al., 2016; Cheng et al., 2005). Plant generates various mechanism to protect itself from ROS and antioxidant enzymes are one of them. The representative antioxidant enzymes of plant are known as catalase, peroxidase and superoxide dismutase. Sairam et al. (2000) also reported that antioxidant activity was elevated by heat stress to reduce stress damage in wheat. To breed heat stress tolerant rice, many researches have been conducted (Zhang et al., 2014; Yugandhar et al., 2013; Jeong et al., 2016). Ilmi, one of the Korean leading varieties, was considered as heat tolerance rice by many researches (Shon et al., 2015; Jeung et al., 2016). The objective of this study was to determine heat tolerance characters of Ilmi rice under high temperature during ripening stage. Two Korean leading varieties (Oryza sativa L.), Ilmi and Ilpum, were used as materials. The 14 days old plants of each material were transplanted into 1/5000-a wagner pots. Plants had been cultivated in natural condition until the heading was appeared. Two days after heading, each pot cultivated in phytotron. Phytotron condition was created two groups, control and heat condition. Temperature was set at 22/32℃ for heat treatment condition and 16/26℃ for the control condition. Temperature in phytotron was gradually changed in every hour then reached the highest temperature at 2 pm, the lowest temperature at 2 am. Light was controlled as natural condition. Panicles and flag leaf were harvested every four to five days during ripening stage (five replications per group). They were then dried for 3 days in a green-house to adjust water content in grain. To analyze the quality of rice, forty panicles were harvested when accumulated temperature reached 1100℃. The quality of rice was determined using RN-300 (Kett. Ins. Japan). Chlorophyll content in flag leaf was analyzed following method of Yang (Yang et al., 2006). The 80% of ethanol was added to 0.1 g of grounded leaf sample and stored at 4℃ chamber until the leaves were discolored. The final amount of ethanol extraction was adjusted to 10 ml. Supernatant in ethanol extraction solution was taken to determine the absorbance at 645 nm and 663 nm using spectrophotometer. Malondialdehyde (MDA) content of leaf was measured following method of Savicka & Skute (2010). The 0.2 g of fresh leaf was grounded using liquid nitrogen then homogenized with 2 ml of 0.1% trichloroaceticacid (TCA). After centrifuged for 15 min at 14,000 rpm, 1 ml of the supernatant was mixed with 2.5 ml of 0.5% TBA in 20% TCA. The mixed solution was incubated in hot water for 30 min. Cooled reaction mixture was centrifuged at 10,000 rpm for 30 min then absorbance was measured at 532 and 600 nm using spectrophotometer. Enzyme was extracted using 100mM KBP solution (pH 7.8) containing 1mM EDTA and DMSO. Enzyme extraction regent and sample were mixed well and sonicated for 5 minutes at 4℃. The enzyme extracted solution was centrifuged at 13000 rpm at 4℃ for 30 minutes. Supernatant was taken and measured protein content using protein assay kit (BIO- RAD). After adjusted protein content as same in each enzyme extracted solution, catalase (CAT), superoxide dismutase (SOD) and peroxidase (POX) activity were measured. CAT activity was measured following the method of Decker (1977). SOD activity was measured using Superoxide Dismutase Activity Assay Kit (CELL BIOLABS, STA-340). SOD activity was measured as O2- inhibition rate (%) after generated O2- by a Xanthine/Xanthine Oxidase system. POX activity and H2O2 content were measured using Hydrogen Peroxide/Peroxidase Assay Kit (CELL BIOLABS, STA-844). SAS version 9.2 (SPSS Inc) was used for data analysis. Duncan’s multiple range test (DMRT) was carried out to identify significant differences (P < 0.05) between individual treatments. High temperature has serious effect on rice cultivation. During the ripening stage, rice yield and quality can be reduced by high temperature (Dolferus et al., 2011). Ilmi and Ilpum rice are one of the leading rice varieties in South Korea. However, they showed different ripening characters according to different temperature. Peng et al. (2004) and Tashiro & Wardlaw (1991) have reported that temperature above 26℃ during early ripening stage decrease grain size and yield in rice. Similarly, 20% of ripening rate was decreased in Ilpum under heat condition compared to control condition (Fig. 1A). However, ripening rate of Ilmi decreased 2% under heat condition compared to control condition. The dry weights of 1000 grains of Ilpum rice showed significant difference between heat and control condition especially in early ripening stage (Fig. 1B). But in Ilmi, dry weights of 1000 grains did not show significant difference under heat and control condition. The ripening rate was significantly decreased under heat stress in llpum, however the decrease of the 1000 grain weight did not show in a such condition. It was considered that we harvested the main tillers which had good ripening compared to other tillers to analyze the change the 1000 grain weight. Based on these data, we could suggest that starch synthase in Ilmi rice might not be affected by heat stress. In this research, we cultivated rice in pot. Therefore we cannot provide the yield data. Ripening rates of (A) Ilmi and Ilpum. Ripening rate was analyzed after harvesting 40 panicles from each material cultivated under different temperature conditions. (B) Change of 1000 grain weight of Ilmi and Ilpum between heat and control conditions. Five panicles were harvested, and then dry weight of the grain was measured daily for 5 days during ripening stage. Water content in grains was adjusted to 14%. Change of 1000 grain weight was calculated by comparing 1000 grain weight under heat and control conditions. Different letter indicates significant difference at P ≤ 0.05 using Duncan’s multiple range test. Analyzing brown rice quality, 5 and 16% of normal rice was decreased by heat stress in Ilmi and Ilpum, respectively (Fig. 2A). Immature grain rates in brown rice were increased as 10.2 and 21.6% in Ilmi and Ilpum, respectively under heat condition (Fig. 2B). The quality of milled rice also showed difference between Ilmi and Ilpum rice. Head rice rates in milled rice were 81 and 77% in Ilmi and Ilpum in control condition, respectively (Fig. 2C). Under heat condition, head rice rates of Ilmi and Ilpum were decreased as 77 and 50%, respectively. Chalky rice rates in milled rice were increased as 1.6 and 14.3% in Ilmi and Ilpum, respectively under heat condition even it was similar as about 0.5% in control condition (Fig. 2D). Rice quality has been reported to be deteriorated by frequent extremely high temperature (Morita, 2011; Terashima et al., 2001). And chalky grain has been reported to be one of the most prominent forms in rice induced by heat stress during ripening stage (Asatsuma et al., 2006). We also considered that heat stress might decreased rice quality in Ilmi and Ilpum. However, the rice quality was much stable in Ilmi compared to Ilpum under heat stress condition. Especially, the occurrence of chalky rice in Ilmi rice was significantly lower than that in Ilpum under heat stress. With these data, we could confirm that Ilmi has tolerance characters against high temperature during ripening stage. Analysis of rice quality under different temperature conditions. (A) Normal and (B) immature rice rate (%) of brown rice. (C) Head and (D) chalky rice rate (%) of milled rice. Quality of rice was determined using RN-300. Different letters indicate significant difference using Duncan’s multiple range test (P < 0.05). Majid et al (2011) reported leaf chlorophyll content was highly related with stress resistance. They reported the stress resistant cultivar in maize showed higher leaf chlorophyll content under stress condition. The chlorophyll a content was reported 2~3 times higher than chlorophyll b (Kramer and Kozlowski, 1979). The chlorophyll a/b ratio could be changed according to stress condition (Pearcy and Sims, 1994). Chlorophyll a/b ratio was reduced by leaf senescence (Kura-Hotta et al., 1987) and Shamsi (2010) reported that chlorophyll a/b ratio reduced according stress condition in wheat. Therefore, we checked the leaf chlorophyll a/b ratio in cultivars under heat stress condition using flag leaf to confirm stress effect on the plant in each cultivar. Chlorophyll a/b ratio started to reduce at 15 days after heading in both cultivars (Fig. 3A). However, the chlorophyll a/b ratio in Ilmi were nearly 6~8% less reduced compared since 15 days after heading. MDA content in leaf is also considered to change according to stress in plant. Therefore, we checked MDA content of leaf in both cultivars under heat stress condition at ripening stage (Fig. 3B). In Ilmi, MDA content in flag leaf did not show significant increase during ripening period under heat stress condition. However, MDA content in flag leaf of Ilpum started to increase 20 days after heading. MDA content of Ilpum increased 1.4 ~ 1.75 times more during ripening period under heat condition. Based on these data, we confirmed that Ilmi rice plant has stronger characteristics against high temperature stress than Ilpum. Change of (A) leaf chlorophyll a/b ratio and (B) malondialdehyde (MDA) content of flag leaves of Ilmi and Ilpum under heat treatment during ripening stage. Leaf chlorophyll a/b ratio and MDA content were measured in flag leaf cultivated under heat condition with five replications. Vertical bars indicated standard errors. It is known that when plant is stressed, reactive oxygen species (ROS) are produced in the plant and these ROS suppressed various actions related to plant growth (Bhattacharjee, 2005; Dat et al., 2000). Therefore, plant promotes the enzymatic action such as catalase (CAT), peroxidase (POX) and super oxide dismutase (SOD) in order to efficiently remove the ROX in plant (Almeselmani et al., 2006; Asada et al., 1987; Dat et al., 1998). To confirm the antioxidant enzyme effect on heat tolerance in Ilmi, we checked the SOD, CAT and POX activity in flag leaf during ripening stage under heat condition (Fig. 4). 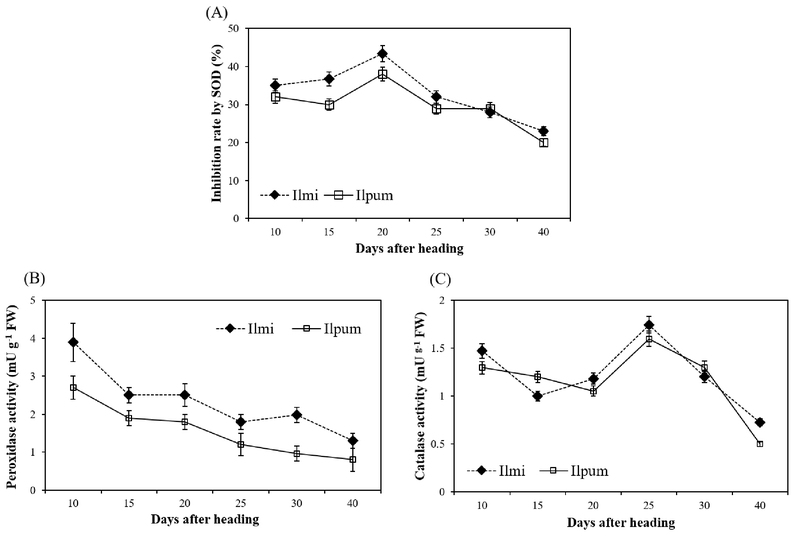 Change in enzyme activity under heat stress condition during ripening stage in Ilmi and Ilpum. (A) Inhibition rate of superoxide dismutase (SOD, %). (B) Peroxidase (POX) and (C) catalase activity. Enzyme activity was measured in flag leaf with five replications. Vertical bars represent standard errors. Inhibition rate (%) by SOD was increased until 20 days after heading and decreased after 25 days heading at heat stress condition in both cultivars (Fig. 4A). Even though inhibition rate (%) by SOD was higher in Ilmi than Ilpum until 20 days after heading, it did not show significant difference among cultivars at 25 days after heading. POX activities in both cultivars were gradually decreased according days after heading (Fig. 4B). However, Ilmi showed 1.3~2.0 times higher POX activity than Ilpum in all ripening period. CAT increased until 25 days after heading then decreased in both materials, but did not show significant difference between cultivars (Fig. 4C). With these data, we could suggest that POX activity might be mostly related with heat tolerance characters of Ilmi among antioxidant enzymes. To confirm the relation of each enzyme activity with change of leaf chlorophyll a/b ratio, we checked the correlation between leaf chlorophyll a/b ratio and each enzyme activity in Ilmi (Fig. 5). The change of each value during ripening stage was calculated by comparing with the data which before heat treatment. 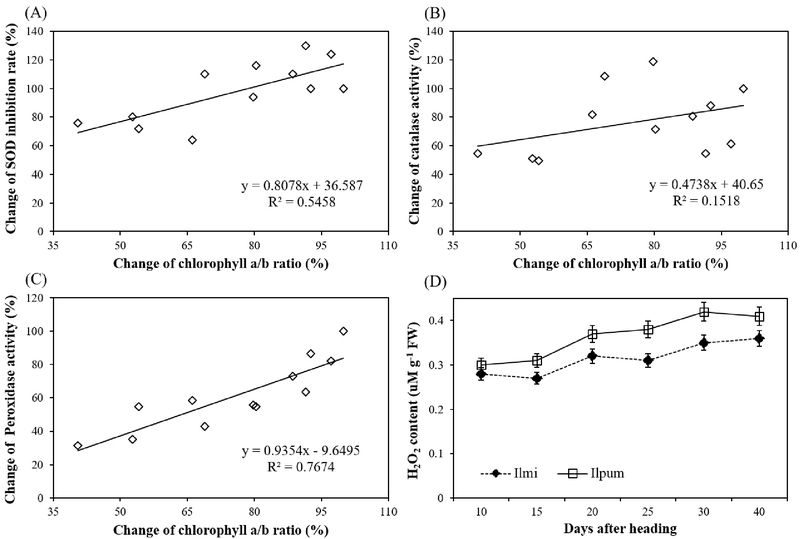 SOD and CAT activity showed less correlation with chlorophyll a/b ratio than POX activity. SOD and CAT activity showed correlation with leaf chlorophyll a/b ratio as 0.54 and 0.15, respectively. POX activity correlation with leaf chlorophyll a/b ratio was 0.77. Therefore, we could suggest that POX could mostly related with less reduction of chlorophyll a/b in Ilmi under heat condition. POX mainly removes the H2O2 in plant. Analyzing H2O2 content (Fig. 5D), H2O2was less increased in Ilmi than Ilpum under heat stress condition. H2O2 content in flag leaf was similar at 10 days after heading in cultivars, but Ilmi showed 7 to 19% less H2O2 content compared to Ilpum during ripening period. 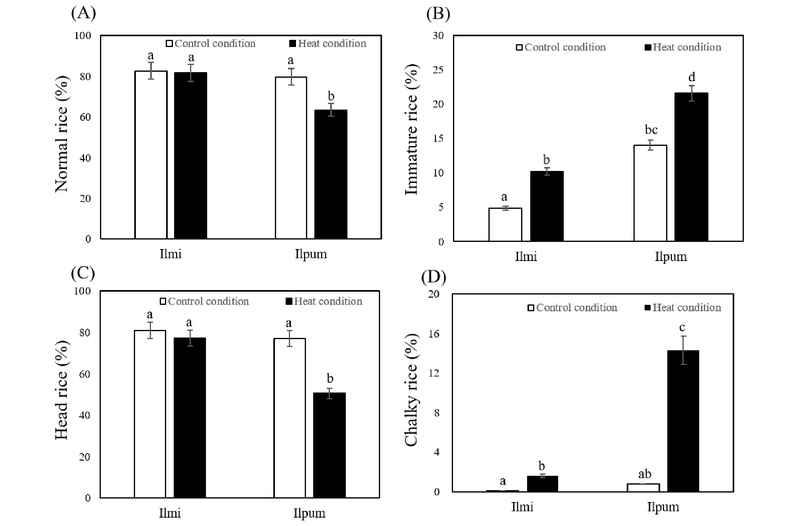 Regarding these results, we could conclude that the high POX activity of Ilmi rice might effectively reduce H2O2 content in plant and low H2O2 content could help to reduce the stress response to high temperature. Analysis of correlation between change in chlorophyll a/b ratio and change in enzyme activity of flag leaf with (A) superoxide dismutase (SOD) inhibition rate (%), (B) catalase (%), and (C) peroxidase (%) activities Change in each value during ripening stage was calculated by comparing data before and after heat treatment. (D) Change in hydrogen peroxide (H2O2) content of flag leaf of Ilmi and Ilpum during ripening stage under heat condition. Heat stress greatly effect on rice yield and quality during ripening stage. Therefore the breeding of heat tolerance rice and investigation of heat tolerance characteristic are important. We analyzed the heat tolerance characteristics of Ilmi which is one of the major leading rice cultivars in South Korea. Ilmi showed less reduction of yield and quality under heat stress compared to Ilpum. Analyzing the leaf condition under heat stress condition, chlorophyll a/b ration and MDA content in flag leaf were more stable than Ilpum. Among antioxidant enzyme, POX activity in Ilmi was significant higher than Ilpum and showed significant correlation with change of chlorophyll a/b ratio. H2O2content in flag leaf which scavenged by POX was also reduced and showed significantly correlation with POX activity. With these data, we strongly suggested that higher POX enzyme activity of Ilmi could be one of the major heat tolerance characters. This work was supported by a grant from the Crop production and physiology, NICS, RDA(No. PJ01156002), Rural Development Administration, Republic of Korea. Almeselmani, M., P. S. Deshmukh, R. K. Sairam, S. R. Kushwaha, and T. P. Singh. 2006. Protective role of antioxidant enzyme under high temperature stress. Plant Science 171 : 382-388. Asada, K. and M. Takahashi. 1987. Photoinhibition. In:Kyle D.J., Osmond C.B., Arntzen C.J (eds.). Production and Scavenging of active Oxygen in Photosynthesis. Amsterdam: Elsevier P. 227-287. Asatsuma, S., C. Sawada, A. Kitajim, T. Asakura, and T. Mitsui. 2006. a-amylase affects starch accumulation in rice grains. Journal of Applied Glycoscience 53 : 187-192. Bhattacharjee, S. 2005. Reactive oxygen species and oxidative burst: Roles in stress, senescence and signal transduction in plant. Current Science 89(7) : 1113-1121. Chen, G., Z. Q. Q. Wang, Liu, F. Xiong, Y. J. Gu, and G. J. Gu. 2006. Development and substance accumulation of caryopsis in transgenic rice with antisense Wx gene. Rice Science 13 : 106-12. Cheng, F., L. Zhong, N. Zhao, Y. Liu, and G. Zhang. 2005. Temperature induced changes in the starch components and biosynthetic enzymes of two rice varieties. Plant Growth Regul. 46 : 87-95. Dat J. F., H. Lopez-Delgado, C. H. Foyer, and M. I. Scott. 1998. Parallel changes in H2O2 and catalase during thermos-tolerance induced by salicylic acid or heat acclimation in mustard seedling. Plant Physiology 110: 1351-1357. Dat, J. F., S. Vandenabeele, E. Vranova, M. Van Montagu, D. Inze, and V. Bresusegem. 2000. Dual action of the active oxygen species during plant stress responses. Cell Mol. Life Sci. 57 : 779-795. Dolferus, R., X. M. Ji, and R. A. Richards. 2011. Abiotic stress and control of grain number in cereals. e Plant Science 181 : 331-41. IPCC. 2013. Fifth Assessment Report (AR5). WMO/UNEP. Jeong, J. U., Y. S. Shin, I. S. Choi, J. K. Chang, M. K. Kim, J. H. Lee, H. M. Park, C. I. Yang, Y. H. Jeon, J. P. Suh, I. B. Choi, J. M. Jeong, N. S. Sung, J. H. Lee, M. R. Yoon, and C. K. Kim. 2016. Blast resistant early maturing rice ‘Jungmo 1024’ with high temperature tolerance during grain filling stage. Korean J. Breed. Sci. 48(1) : 72-84. Kaneko, K., M. Sasaki, N. Kuribayashi, H. Suzuki, Y. Sasuga, T. Shiraya, T. Inomata, K. Itoh, M. Baslam, and T. Mitsui. 2016. Proteomic and glycomic characterization of rice chalky grains produced under moderate and high temperature conditions in field system. Rice 9:26. Kim, J., J. Shon, C. Lee, Y. Yong, W. Yang, Y. Kim, and B. Lee. 2011. Relationship between grain filling duration and leaf senescence of temperate rice under high temperature. Field Crops Research 122 : 207-213. Kramer, P. J. and T. Kozlowski. 1979. Physiology of wood plants. Academic Press, New York, pp. 811. Kura-Hotta, M., K. Satho, and S. Kathh. 1987. Relationship between photosynthesis and chlorophyll content during leaf senescence of rice seeding. Plant cell physiology 28(7), 1321-1329. Lloret, F., A. Escudero, J. M. Iriondo, J. Martínez-Vilalta, and F. Valladares. 2012. Extreme climatic events and vegetation: the role of stabilizing processes. Global Change Biol 18(3), 797-805. Majid, K., G. Roza, J.S. Shahzad, and Z. M. Roghayyeh. 2011. The leaf chlorophyll content and stress resistance relationship considering in Corn cultivars (Zea. Mays). Advances in Environmental Biology 5(1), 118-122, 2011. Morita, S. 2011. High temperature damage in rice and its measures. Tokyo : Nosan Gyoson Bunka Kyokai. Morita, S., J. Yonemaru, and J. Takanashi. 2005. Grain growth and endosperm cell size under high night temperatures in rice (Oryza sativa L.). Annals of Botany 95 : 695-701. Nakagawa, H., H. Tanaka, N. Tano, and H. Nagahata. 2006. Effects of leaf and panicle clipping on the occurrence of various types of chalky kernels in rice. Hokuriku Crop Science 41 : 32-44. Pearcy, R. W. and D. A. Sims. 1994. Photosynthetic acclimation to changing light environments: scaling from the leaf to the whole plant. In Ecophysiological Processes Above and Below Ground. Eds. M.M. Caldwell and R.W. Pearcy. Academic Press, New York, pp. 145-174. Peng, S., J. Huang, J. E. Sheehy, R. C. Laza, R. M. Visperas, X. Zhong, G. S. Centeni, G. S. Khush, and K. G. Cassman. 2004. Rice yields decline with higher night temperature from global warming. Proceedings of the National Academy of Sciences USA, 101 : 9971-9975. Porter, J. R. and M. Gawith. 1999. Temperatures and the growth and development of wheat. European Journal of Agronomy. 10: 23-36. Sairam, R. K. G. C. Srivastava. and D. C. Saxena. 2000. Increased antioxidant activity under elevated temperature: a mechanism of heat stress tolerance in wheat genotype. BIOLOGIA PLANTARUM 43(2) : 245-251. Savicka, M. and N. Skute. 2010. Effects of high temperature on malondialdehyde content superoxide production and growth changes in wheat seedlings (Triticum aestivum L.). Ekologija 56(1) : 26-33. Shamsi, K. 2010. The effects of drought stress on yield, relative water content, proline, soluble carbohydrates and chlorophyll of bread wheat cultivars. Journal of Animal & Plant Sciences 8(3) : 1051- 1060. Shon, J. Y., J. H. Kim, C. K. Lee, and W. H. Yang. 2015. Effect of high temperature on leaf physiological changes as chlorophyll composition and photosynthesis rate of rice. Korean J. Crop Sci. 60(3) : 266-272. Siebert, S., F. Ewert, E. E. Rezaei, H. Kage, and B. R. Gra. 2014. Impact of heat stress on crop yield-on the importance of considering canopy temperature. Environmental Research Letters 9 : 044012. Tashiro, T. and I. F. Wardlaw. 1991. The effect of high temperature on kernel dimensions and the type and occurrence of kernel damage in rice. Australian Journal of Agricultura Research 42 : 485-496. Terashima, K., Y. Saito, N. Sakai, T. Watanabe, T. Ogata, and S. Akita. 2001. Effects of high air temperature in summer of 1999 on ripening and grain quality of rice. Japanese Journal of crop science 70 : 449-458. Ugarte, C., D. F. Calderini, and G. A. Slafer. 2007. Grain weight and grain number responsiveness to pre-anthesis temperature in wheat, barley and triticale. Field Crop Research 100 : 240-8. Yang, W. 2006. Physiological characterization of high yielding genotypes of rice (Oriza sativa L.) in the tropical irrigated system. University of Philippines at Los Banos. Ph. D. Thesis. pp. 51-52. Yugandhar, P., K. B. Ramana, P. Madhusmita, P. V. Vishnu, R. D. Nageswara, R. V. Sitapathi, D. Subrahmanyam, and N. Sarla. 2013. Characterization of a Nagina22 rice mutant for heat tolerance and mapping of yield traits. Rice 6 : 36. Zhang, H., L. Duan, J. S. Dai, C. Q. Zhang, J. Li, M. H. Gu, Q. Q. Liu., Y. Zhu. 2014. Major QTLs reduce the deleterious effects of high temperature on rice amylose content by increasing slicing efficiency of Wx pre-mRNA. Theoretical and Applied Genetics 127(2) : 273-282.